An animal welfare charity has expressed disappointment after a man who taped a hamster to a firework was sentenced to 220 hours community service. The Scottish SPCA said Steven Gordon, 20, from Glasgow, had subjected the animal to a terrible death. 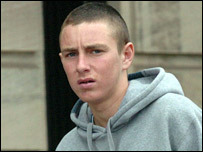 Gordon was convicted of animal cruelty after trial at Glasgow Sheriff Court. A Scottish SPCA spokeswoman said: "We were disappointed to hear that the sentence awarded in this case did not involve a custodial element." Mobile phone footage showed the hamster being taped to a rocket which was then stuck in the ground and lit in Possilpark. Sheriff Gillian Bryson sentenced Gordon to 220 hours community service. The Scottish SPCA suggested the Scottish courts should follow the lead of some American states where psychiatric assessments are carried out anyone guilty of animal cruelty. A spokeswoman added: "Significant research indicates that this level of violence to animals can often progress as teenagers get older."